Nearly a month ago, I started out on an unplanned prayer project. I'd heard of people doing 30 day prayer challenges but never really put much thought into starting one because I had a prayer journal and I was comfortable with my daily routine. But I found myself changing it up without even thinking about it. I've seen God do so much work in my life and in the work of others and knew that my relationship with Him could only be better and stronger than what it was and is today. I was challenged in a blog post or devotional to really dig into the Bible, to spend more time with God, to really take my relationship with Him on a new level. So I decided to do the complete opposite of what I've done with singleness lately. Instead of completely putting it on the backburner, I made it something I would intentionally pray about and journal about every single day for a month. I went into it thinking that it would only make things worse, but God had other plans for me. He worked in me and let me just pour out every thought, every worry, every doubt I've had in terms of my appearance, my self-worth, my trust issues, my patience, and so much more. I let tears pour out, I let my fears come out from the bottom of my heart, and I let Him work in me. I didn't go into it thinking that I would grow, but I'm finding that I am and have. I'm no where near perfect, but it's a challenge and one that I know has helped me in more ways than one. So what are your thoughts on prayer? Have you ever completed a 30 day prayer challenge? Or prayed with a theme or purpose (for lack of a better word)? Hmmm...thanks for this post. I love to journal and often do it as a prayer or processing what I'm reading in the Bible. I stopped for awhile, just busy-ness of life I guess, but I'm been more intentional about it lately and it makes a big difference in my relationship with Him. 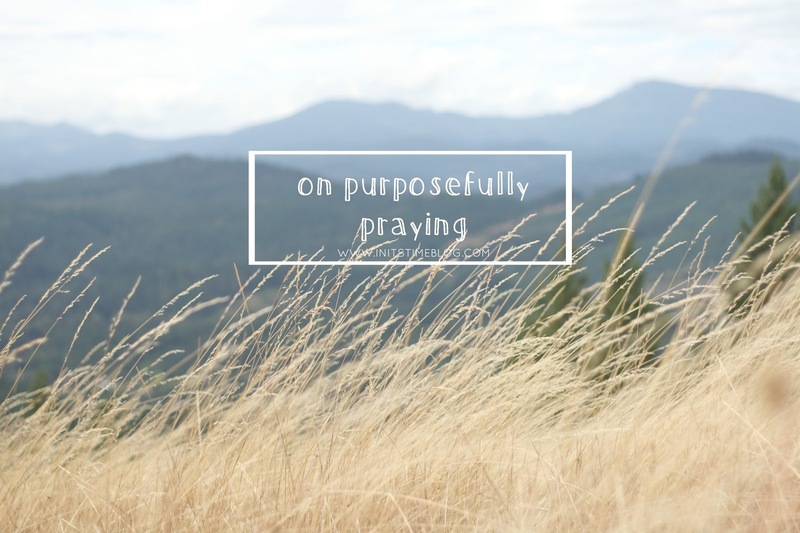 I've been thinking a lot lately about praying more intentionally. Thanks for sharing your story. I did something similar a few summers ago. It was a wonderful experience. I truly believe that my intentional period of prayer helped open doors that led me out of singleness. Thanks for being honest, and vulnerable...and for challenging us as your readers! Praying with a purpose in mind is beautiful....because I think God just delights in hearing from us, and in honesty from our hearts. I am so glad that you felt encouraged and built up in Christ! Praying for you right now friend! I usually write my prayers down in my journal. Love it. :) I've had a similar "relationship" with prayer in the past. I just hadn't been intentional about having conversations with God. Also, I've been doodling/journaling my prayers too, mostly while listening to music. That helps to get the juices flowing. :) I've never done a prayer challenge, but that does sound interesting... maybe as a Circle Topic? And I love the idea of doodling and journaling prayers while listening to music! I do that sometimes, too, and it's super relaxing and a great way for me to decompress every night. Who knows this kind of thing could be a Circle topic someday--great idea!! Please ignore the gap of time between when you wrote this and how I'm now commenting. I recently found a book on Amazon that is a 30 day devotional -- The 30 Day Praise Challenge and it gives daily devotionals, questions to reflect on, and then praise and worship songs to go along with each. I started it the beginning of September, but with moving and everything, I've missed quite a few days. Now that I'm settled, I'm ready to jump right back in. My prayer life is something that the Lord has continuously shown me needs to be improved. Hey, there are no expiration dates in blogging! :) I know that re-reading posts months later is therapeutic for me. That sounds like a great devotional! I love any book/tool that helps you find more reasons to praise Him. I was just reminded today at church that I need to put my hope in Him and really just praise Him for all that He's given me--especially forgiveness! :) Anyway, I need to go check out that book, it sounds like a great one!